Obama Seeks Fla. Electoral Votes In Puerto Rico : It's All Politics On his arrival Tuesday, Obama mentioned his support for a referendum which would probably result in a vote for statehood. That should please those Puerto Rican Floridians and could make them more amenable to voting for Obama in November 2012. 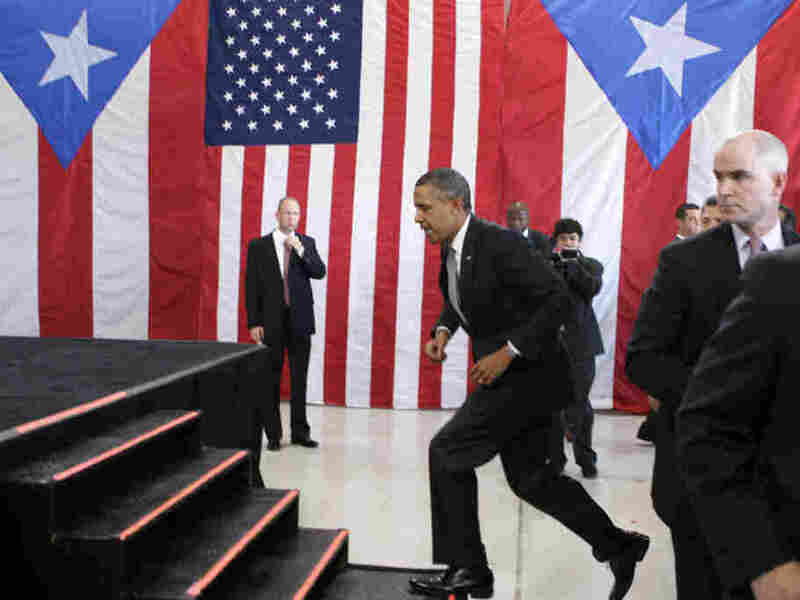 President Obama bounds to the stage in an airport hanger at Muniz Air National Guard Base, June 14, 2011, San Juan, Puerto Rico. Maybe it's cynical of us political observers or just an acknowledgement of election-cycle reality. But perhaps the best prism through which understand President Obama's Puerto Rico visit Tuesday is the electoral college. Using that filter, his trip is his attempt to make sure Florida's growing Puerto Rican population in his corner next year. "There's a lot riding on this trip," said former Miami Mayor Maurice Ferré, who was born in Puerto Rico and follows both Florida and island politics closely. "It's all about Florida. It has nothing to do with Puerto Rico or anything else." There are now 857,000 Puerto Ricans in Florida, a population estimate that Ferré believes is undercounted by at least 20,000. With another 35,000 leaving the island each year, the former U.S. Senate candidate believes Puerto Ricans in the Sunshine State could hover just under a million by next year's election. "It's a swing state," Ferré said. "Nobody cares what the Puerto Ricans in New York have to say — because they know those are Democratic votes. Just like it doesn't matter what the Mexicans in Texas say, because those are guaranteed Republican votes. You can't win the presidency without winning Florida." Robles Miami Herald piece is must reading for an understanding the political dimensions of the president's Puerto Rico trip. The Obama administration has officially said the trip follows on the release of the report by the president's Task Force on Puerto Rico's status. That report dealt with how the island might proceed towards whatever status its people ultimately decide is right for it, whether a state or commonwealth. It just so happens, as Robles reports, that many Puerto Ricans who've left the island for the mainland, and Florida in particular, support statehood for the island. On his arrival Tuesday, Obama mentioned his support for a referendum which would probably result in a vote for statehood. That should please those Puerto Rican Floridians and could make them more amenable to voting for Obama in November 2012. Elected the same year as Obama, he's a Republican who has more in common with the budget-cutting and tax-cutting Republicans in statehouses across the U.S. than with the president. "What I aspire to do is make sure that we highlight the issues that affect the almost 4 million American citizens that reside here in Puerto Rico," he told NPR in an interview Monday. "Certainly, the economy is the No. 1 issue here — as well as in the rest of the country — and I'll be raising that issue with the president and ways we can work together for job creation," Fortuno said. Some have questioned why Obama would meet with Fortuno. It's simple. It's another example the president will be able to point to that he's willing to work across party lines. That could appeal to political independents as well as some Puerto Ricans in Florida who are Republican. And they'll be talking about the economy and jobs, topics the president wants voters seeing him focusing on everyday, even when he's traveling off the mainland.